NYSF is a non-profit organisation that runs a number of residential programs to encourage young people in their passion for science. The NYSF Year 12 Program is a 12-day residential program designed to give students a broader understanding of the diverse study and career options available in science, technology, engineering and mathematics (STEM). 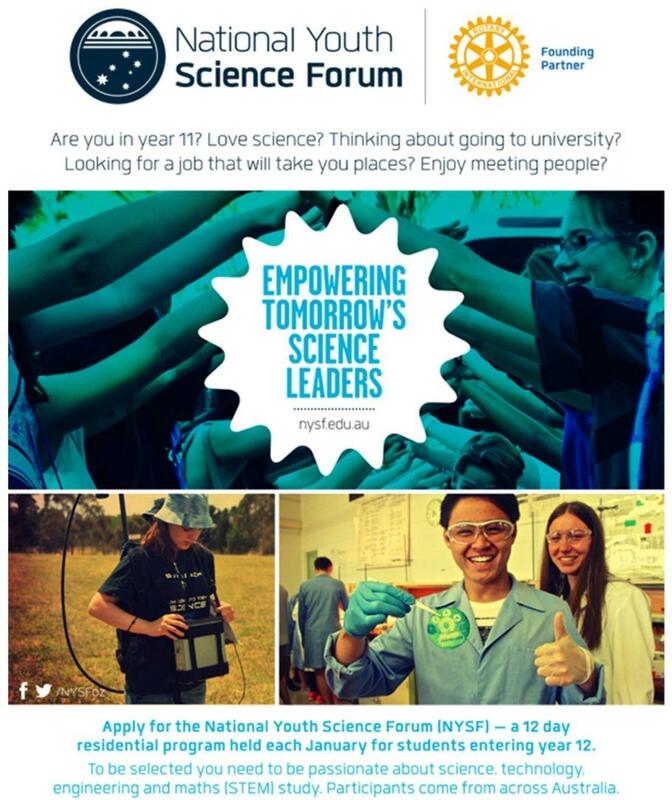 With the support of Rotary clubs across Australia, students in year 11 apply to attend the NYSF Year 12 Program. If appropriate, students are then endorsed for selection at Rotary district panels. Applications are open from 1 March to 31 May each year. Please note that Rotary District 9675 will be holding interviews in the Sydney CBD on Saturday 20th July, 2019 (TBC).